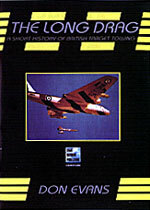 Flight Recorder's latest title called The Long Drag is out now. Subtitled 'A Short History of British Target Towing', it has already been voted Book of the Month in its very first review! Written by Don Evans, who joined the RAF in 1942 and served as a Flight Mechanic working on Hurricanes and Defiants. Posted to Weston Zoyland in 1944 to service Martinet, Henley and Defiant target tugs, he was persuaded by the princely sum of ninepence a day flying pay to complete 90 hours as a target winch operator. He transferred to the Fleet Air Arm in 1945 until demobilisation in 1947, whereupon he began working at the A&AEE at Boscombe Down until his retirement in 1989. For 12 years he was supervisor of the Towed Target Development Section, where he was when awarded the British Empire Medal for the design of the Trident Target and the Rapid Target Exchanger. He is still involved with Boscombe Down where he looks after over 1,000 scale model aircraft.